Excellent staff, great location and nice property. The property has a great restaurant and awesome gym. The staff was very friendly and helpful. Great location. In the heart of the shopping district; also very close to Pike Place Market, Pioneer Square, etc. Excellent location, located within walkable distance to pike place market and major shopping centre, and you can see the Space Needle on the street!! 10 minutes walk to pacific place, macy's, cheesecake factory, 15-20 minutes walk to pike public market. Pike Place Market is just a few blocks away as are any shopping and a great deal of wonderful restaurants. It was in a central location to get to the stadiums in the area and Pike's Place Market. Walked across the street for breakfast at a local cafe and Pike Place market was only 2 short blocks away. Pike Place Market is located in a vibrant area of Seattle known for its array of dining options and major shopping area. The neighborhood is home to 485 hotels and other accommodations, so you can find something that works for your stay. 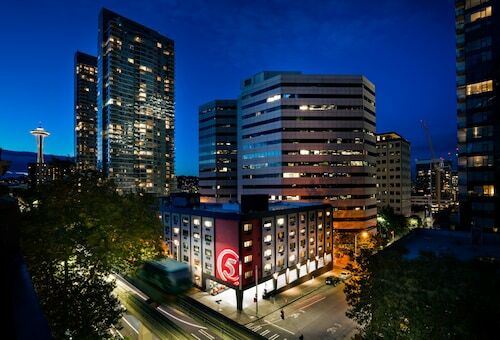 The Paramount Hotel: This 3.5-star hotel features a restaurant, free WiFi, and a 24-hour health club. It's a favorite with Expedia travelers for its overall value and WiFi. 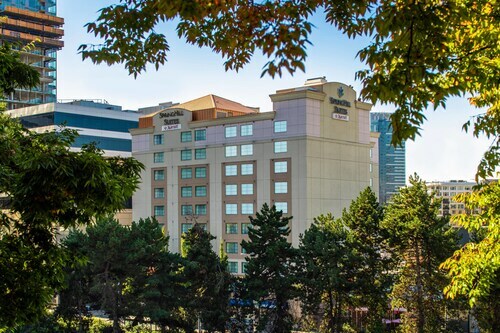 Hotel Max: This 3.5-star hotel features a restaurant, free WiFi, and a 24-hour fitness center. It's a favorite with Expedia travelers for its bar and breakfast. Now that you've visited Pike Place Market, you can discover the sights and attractions within a couple miles of the area. Study the collections at Chihuly Garden and Glass, Museum of Pop Culture, or Seattle Art Museum. Seattle Great Wheel, Seattle Waterfront, and Pioneer Square are some of the local landmarks to explore. You can check out the local talent at Moore Theater, 5th Avenue Theater, and WaMu Theater. If you want to see more of the surrounding area, you can plan a visit to Seattle Aquarium and Seattle Paramount Theatre. Space Needle is also located 0.9 mi (1.4 km) from Pike Place Market, and Seattle Center is 1 mi (1.6 km) away. With so many transportation options, exploring the area around Pike Place Market is easy. 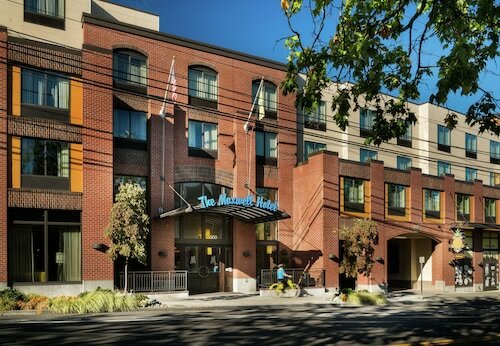 Walk to nearby metro stations like Westlake Station, University Street Station, and Westlake Ave Hub Station. If you're taking a train into town, Seattle King Street Station is the closest station to Downtown Seattle. Flights from Henri Coanda Intl. to Pierre Elliott Trudeau Intl. Flights from Capital Intl. to Pierre Elliott Trudeau Intl.